My imaginary best friends at The Bitten Word, Clay and Zach, posted this recipe today, and I knew I had to try it. 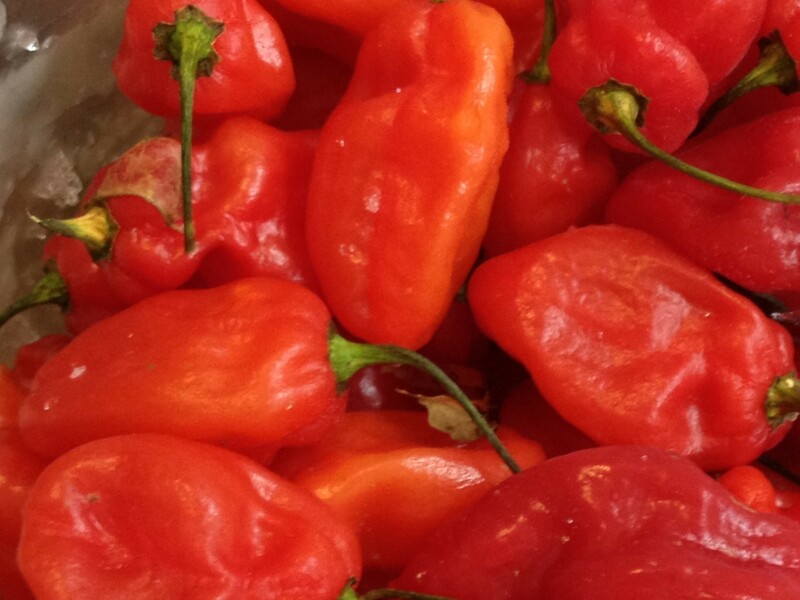 The selling point to me was the Scotch Bonnet chile pepper; I have socked away many from last year’s crop — probably enough to blow up a small country. These babies are H-O-T hot and need to be handled with extreme care. However, don’t let that scare you. The dish itself really isn’t all that powerfully hot. Spread throughout five cups of black-eyed peas and lots of fresh onions, peppers, tomatoes and cucumbers, the pepper’s heat is diffused down to the level of a pleasant little kick. I did make a couple of modifications shown in parentheses below. For starters, I could not abide by one whole cup of oil. I realize you serve this with a slotted spoon and all of the oil isn’t consumed, but — competitive dieting or not — I just couldn’t use that much oil. Will I eat six pieces of bacon? Yes. Will I make a recipe using one whole cup of oil? Never. Don’t try to figure me out. The subject of canola oil is one of hot debate. I considered posting a couple links, but it’s probably better for you to do your own research. Besides, I’m not looking to fight with the powerful canola lobby. I used olive oil because it just felt like the right thing to do. I won’t judge you if you choose to use one whole cup of canola oil, though. 1. In a large bowl, whisk together the lime juice and parsley. While whisking, drizzle in the canola oil to make a smooth dressing. 2. 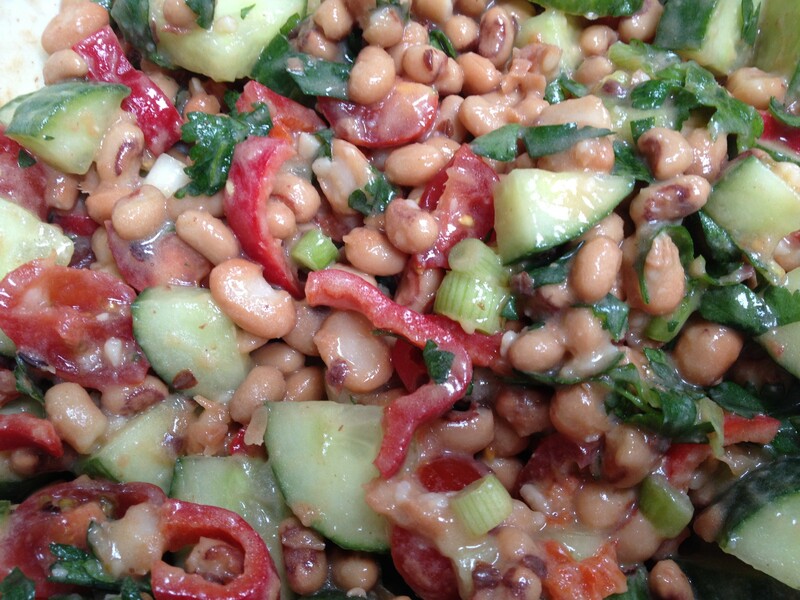 Add the black-eyed peas, scallions, bell pepper, tomato, cucumber, and chile to the dressing. Season the mixture with salt and pepper. Set aside at room temperature for at least 1 hour, or refrigerate up to overnight to marinate and meld the flavors. Serve chilled or at room temperature. Wondering if any astute readers can catch what’s wrong with this picture? This entry was posted in Salads and tagged black eyed pea salad, New Year's day good luck recipe, Saveur May 2012, Scotch Bonnet pepper, Senegalese food by Mom Mom's Apron. Bookmark the permalink. I give up what is wrong with the picture? 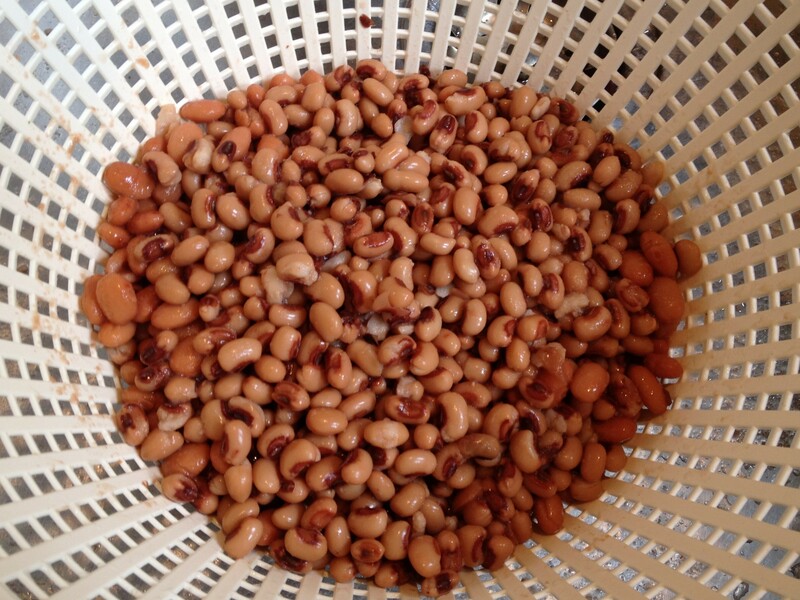 If you look carefully, you will notice that there are some pinto beans mixed in with the black-eyed peas. This is what happens when I go shopping without my glasses.